Every year, the Mason-Lake Conservation District offers sales for tree seedlings and for native plants. Orders for the Spring Tree Sale are usually accepted until early April with pickup held in late April at the Mason County Fairgrounds. The deadline for orders for the 2019 sale is Friday, March 29. Pickup is Friday, April 26 from 2-6pm and Saturday, April 27, 9am-12pm at the Mason County Fairgrounds Community Building. Pickup will also be available in Baldwin for fully paid orders only on Saturday, April 27 from 10am-12pm at the pavillion behind Jones' Ice Cream. The Mason-Lake Conservation District Fall Tree Sale is annually held in October. It is conducted by pre-orders only. Conservation books and conservation products will also be available for sale. Fall tree planting is recommended only for conifers on coarse textured soil (sand and loamy sands), soil that is well or moderately well drained. For more information, visit www.mason-lakeconservation.org. The Annual Native Plant Sale in mid-June June 8, 2019 and will be hosted with AFFEW; the location will be announced later. There are also a variety of plants available for purchase on pick-up day as well. Native plants are great for any landscape and are highly tolerant to year-round weather conditions in Michigan. They are also more resistant to pests, disease and drought. For more information and an order form, visit www.mason-lakeconservation.org. 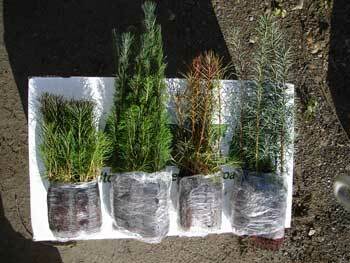 The annual Mason-Lake Conservation District Tree Seedling Sale is held in Spring with pre-orders only. Order early for best selection. Pickup is in late April at the Mason County Fairgrounds. Planting a tree can be very beneficial to the health of the environment. Earth Day and Arbor Day at the end of April is a great time to plant trees, being the first opportunity where the ground is usually warm enough to plant. To learn more about the importance of trees in the environment, you can read our story Make a Positive Environmental Impact this Arbor Day! For more information and an order form, visit www.mason-lakeconservation.org.